Tribute paid to four Jewish hostages murdered by jihadist Amedy Coulibaly at a kosher supermarket one year ago. 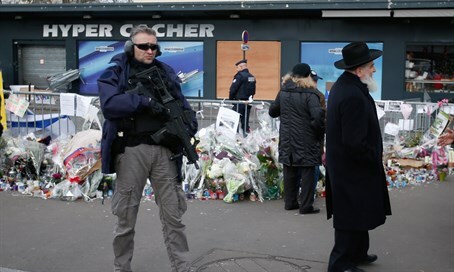 France on Saturday paid homage to four Jewish hostages murdered at a kosher supermarket in Paris a year as part of a spate of jihadist attacks that began with a deadly assault on the Charlie Hebdo weekly. Tributes were also paid to Clarissa Jean-Philippe, a young policewoman who was also murdered by the gunman who went on to carry out the supermarket siege, with President Francois Hollande unveiling a plaque in her honor in the Paris suburb of Montrouge where she was gunned down. A total of 17 people were murdered in the January 2015 attacks which rocked France and touched off a wave of Islamist violence that reached a head in November, when a group of Islamic State (ISIS) gunmen and suicide bombers unleashed mayhem in Paris, murdering 130. The 26-year-old policewoman was killed on January 8 by Amedy Coulibaly, the gunman who went on to attack the Hyper Cacher supermarket in east Paris. Three shoppers and an employee were murdered by Coulibaly before he was killed in a police raid. A gathering to remember the victims will be held outside the supermarket after sundown on Saturday organized by the Jewish umbrella group CRIF. "Despite continuing traumatic feelings, life has returned to normal with a renewed sense of fraternity," said Haim Korsia, France's grand rabbi. The same weekend, mosques around the country are opening their doors to visitors in a move to "highlight the real values of Islam, to set straight the cliches about links to violence and terrorism," Anouar Kbibech, head of the French Council of the Muslim Faith, told AFP. Commemorations will culminate in a public event on Sunday in the Place de la Republique, the vast square that became the rallying point for "Je Suis Charlie" solidarity movement, and for similar movements after the deadly November 13 attacks. There, a 10-meter (35-foot) oak will be planted as a "tree of remembrance." Veteran French rocker Johnny Hallyday will perform "Un Dimanche de Janvier" (One January Sunday), a song recalling the vast mobilization that saw 1.6 million people march in Paris on January 11, 2015.